Stylist Tip: Use this casual handbag as the perfect weekender! I love this purse, it is my new obsession! It is the perfect size- I can fit my wallet, phone, extra wallet with attached keys, car keys, small cosmetic pouch, a mini umbrella, and a water bottle. It does get bulky with all of that stuff in it, but it all fits if needed! It has a variety of pockets so I can keep all of my keys and my phone separate. I got the wine color and I love how it's not the standard brown or black! It is so cute and will work for multiple seasons! The strap adjust adequately for me (I'm 5'8) and it can be a little heavy, but I do put a lot in it. It's a great purse! I love this purse! I get loads of compliments when I'm out and about. It is a little on the small size, I'm only able to fit 1 pair of sunglasses, wallet and phone - but it does the trick. Awesome mid-size crossbody bag! I got the brown (camel) color after waiting for about a month for it to come back in stock. I was also lucky enough to get it at $39.99 as it seems as though the price has increased to $49.99. There is a magnetic closure and the faux leather has a soft and durable feel. Highly reccomended! 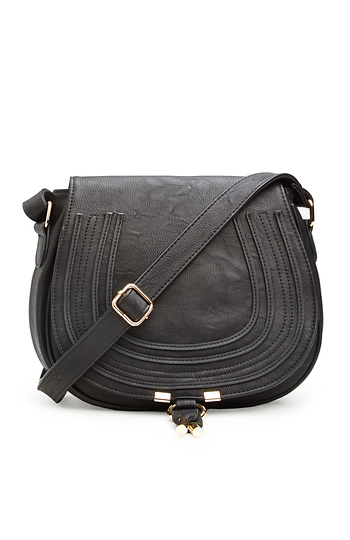 This is a near-perfect dupe for the Chloe "Small Marcie" Leather Crossbody Bag. Just enough space for your purse essentials plus a thin book. 1 outer and 3 interior pockets. One zips the other two are a bit larger than phone size for notes/tissues/phone. I love that it zips AND there's a flap. Usually I just use the flap with the magnetic outer closure so I don't have to futz with the zipper (which works fine, i'm just lazy.) The camel color is just the PERFECT neutral summer-fall transition color. Love that I will get a lot of use out of this bag in at least 2 seasons. Just received this bag today in black. Beautiful bag, soft and I love the lining, perfect size. Great purchase, now I'd like the camel one! This bag is amazing. It has the classic lines of a Chloe bag with a fraction of the price tag! The leather is supple and it is perfect for running errands. It is a must have! Just received the bag today, I love it! I got the wine color and I will probably be getting the camel when it's back in stock! The bag is a tad bit heavier than I thought it would be but it's not bad. The material is soft and feels like real worn-in leather. Perfect size for my personal and work phone, full wallet, keys and sunglasses.